There's a very good reason moms-to-be are advised to be teetotalers: Drinking alcohol puts a woman's pregnancy and her unborn child at risk for a number of potentially devastating outcomes. According to the Centers for Disease Control and Prevention (CDC), drinking alcohol while pregnant can cause miscarriage, stillbirth, and fetal alcohol syndrome disorders (FASDs), a range of physical, intellectual, and behavioral disabilities that affect a baby throughout his or her life. 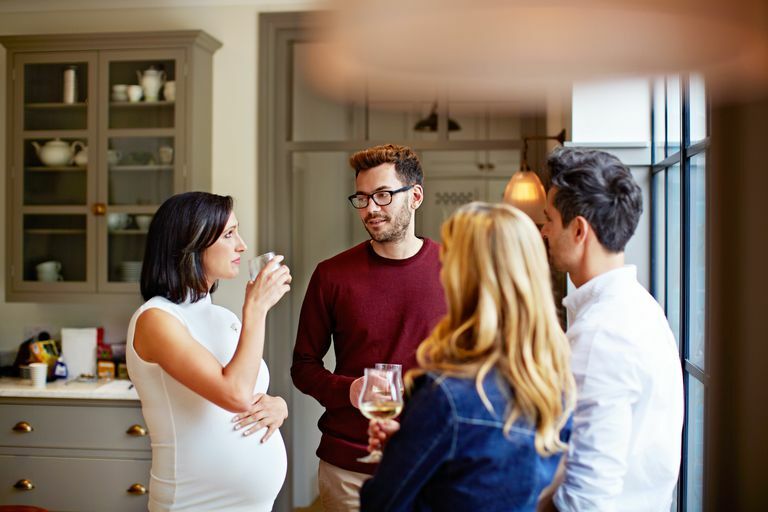 You may have read that a glass of wine once in a while isn't dangerous for a pregnancy, or that once a woman is in the third trimester of pregnancy any alcohol she drinks isn't likely to affect her baby because by that point the baby is fully developed. But research has shown that there's no time during pregnancy when it's safe for a woman to drink, nor is there an amount of alcohol that's safe. For example, a 2017 from Binghamton University, State University of New York, found that any amount of exposure to alcohol during pregnancy could cause significant amounts of anxiety lasting through adolescence and into adulthood. Drinking raises the levels of alcohol in your blood. Because you're an adult, your body has the ability to process this alcohol. At the same time, though, the alcohol in your bloodstream passes to your fetus via the placenta. This means that the significantly smaller and still developing being will wind up with the same amount of alcohol in its blood but without the ability to process it. What's more, alcohol can be especially detrimental to pregnancy even before a woman realizes she's expecting, according to the CDC. Most women won't realize they're pregnant for as many as four to six weeks after they conceive. For that reason, the CDC even advises women who are trying to get pregnant to steer clear of alcohol. Many of these symptoms and problems can be managed after birth, but there is no way to undo the damage that alcohol can cause in a developing child. If you're pregnant, or even trying to become pregnant (remember, you won't know you've conceived until at least a month afterward), it's better to be safe than sorry. Passing on that glass of pinot or opting for a mocktail instead of margarita will be worth it when you give birth to a healthy, happy baby. Henderson, Jane, Ulrik Kesmodel, and Ron Gray, "Systematic Review of the Fetal Effects of Prenatal Binge-Drinking." British Medical Journal, 2007. Rasch, V., "Cigarette, Alcohol, and Caffeine Consumption: Risk Factors for Spontaneous Abortion." Acta Obstetrics Gynecology Scandinavia, Feb 2003. Strandberg-Larsen, Katrine, Naja Rod Nielsen, Morten Grønbæk, Per Kragh Andersen, and Anne-Marie Nybo Andersen, "Binge Drinking in Pregnancy and Risk of Fetal Death." Obstetrics & Gynecology, 2008.